Use Voice Control. Turn Siri off in Settings > General > Siri, then press and hold the Home button until the Voice Control screen appears and you hear a beep, or press and hold the center button on your headset. See Use an Apple headset. Say only Voice Control commands, names, and numbers. Pause slightly between commands. Change the language for Voice Control. By default, Voice Control expects you to speak voice commands in the language that’s set for iPhone (in Settings > General > International > Language). To use Voice Control in another language or dialect, go to Settings > General > International > Voice Control. Voice Control for the Music app is always on, but you can keep Voice Control from dialing when iPhone is locked. Go to Settings > Touch ID & Passcode (iPhone 5s) or Settings > Passcode (other models), and turn off Voice Dial. 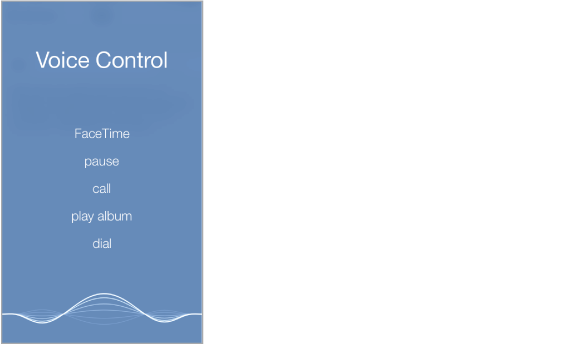 For specific commands, see Make a call and Siri and Voice Control. For more about using Voice Control, including information about using Voice Control in different languages, see support.apple.com/kb/HT3597.